The various steps that people must look for buying their first new camera are discussed below and are expected to be helpful to the ones planning to invest and buy a new camera. Budget forms and plays a major key role in placing bids for a new camera. Some might have a lower budget while some might want for quality cameras at higher prices. But as seen, most of the customers seek for better products at a reasonable price, within their budget. It depends on the type of camera you want to use. It varies from digital Point & shoot cameras to bridge cameras or a digital SLR, the considerations are applicable. It depends on the size you opt for and the type of pictures you want to shoot and capture. A huge factor in buying a new camera falls in the part of its megapixels. The megapixels factor is not an issue nowadays as the megapixel myth is busted by photographers who captured one of the best pictures using their 2MP mobile camera. The entry level of megapixels in today’s world is 8MP which promises to give you good quality print outs. The zooming capacity of a camera is also a factor on the type of pictures you want to capture. The digital point & shoot cameras come with a default 5x optical zoom of while new entry level cameras have improved with a default 16x optical zoom. If you want to use better zoom, you need to opt and invest for an SLR and if you want to take photographs on the walk, all you need is a compact digital point & shoot camera. Our Last Tips for Buying Camera, is the thing which attracts customers more is the “what’s in the box?” thing. Most customers are concerned about the materials the company supply along with the camera – charger, batteries, a memory card, software for image processing, operating manual, USB cable, HDMI cable and a carry case which nowadays are available for every camera you are about to buy. Other than these there are many other factors which you are needed to be concerned of while buying a camera like its video quality, the various scenes available, memories, the image sensors, manual controls etc. But whatever factors you see into, you must make the best effort in choosing the best camera possible. These are our Tips for Buying Camera, although money is yours, choice is yours, and camera will be yours, so it is up to you, what you want in your camera. 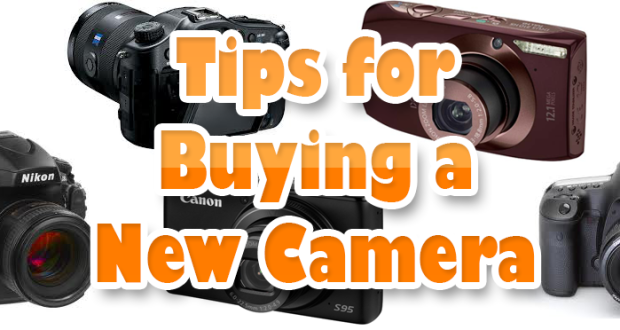 I hope Top Tips for Buying Camera article will help you to Buy new Camera according your requirement, if you also have any Tips for Buying Camera for our readers, please share with us.